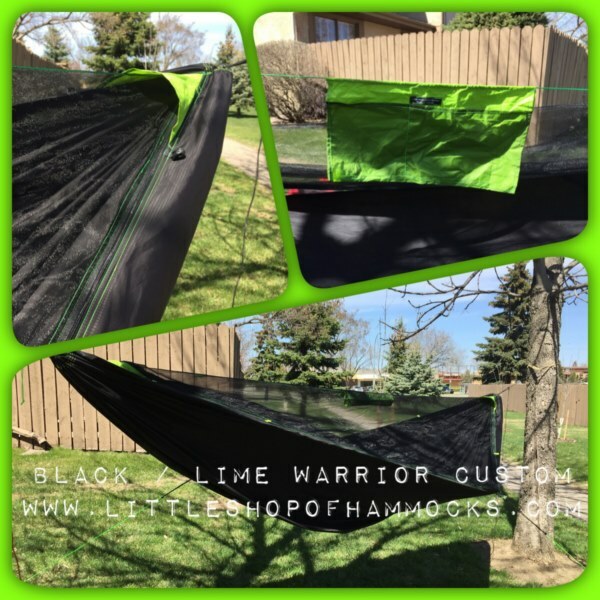 Warrior ‘Edge’ – A totally customized hammock experience. Scroll down below for complete feature details. 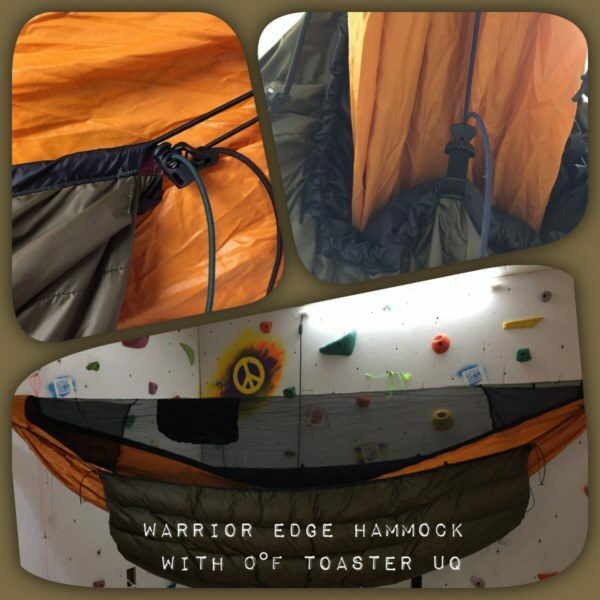 The Warrior Edge features a Unique new design for Hammock Camping . The cut helps to eliminate floppy edges that occur with wider fabrics. The Edge cut does away with excessive claustrophobic flapping fabric. 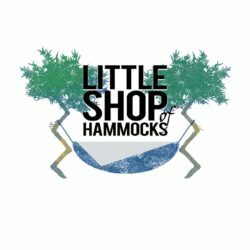 (This cut is truly unique to the Edge Hammock). The ‘Edge’ gives you a wider hammock on the diagonal but not while sacrificing your view of the scenery. This design allows for taller people to be more comfortable giving you more space at the foot end and a great view out of the sides. Peak triangles will be black at the foot end and the hammock color for the head end unless you change them in custom work / contact me in advance. 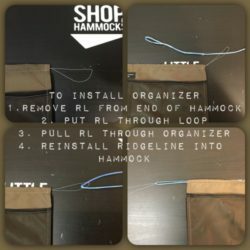 Hammock, Silnylon double ended stuff sack & Ridgeline Organizer. *****Original fabric width is 65″. After the shaping/cutting of the fabric that width is cut down eliminating the excess fabric. This does not however cut down on the diagonal length of the lay. It effectively gives you a ton of more leg room and eliminates weight from the removed fabric. 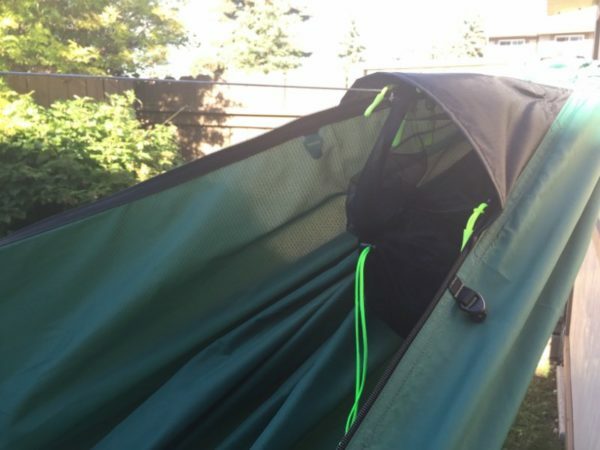 Another added benefit is reduced bulk and weight of the overall hammock compared to a Warrior XL (wide). 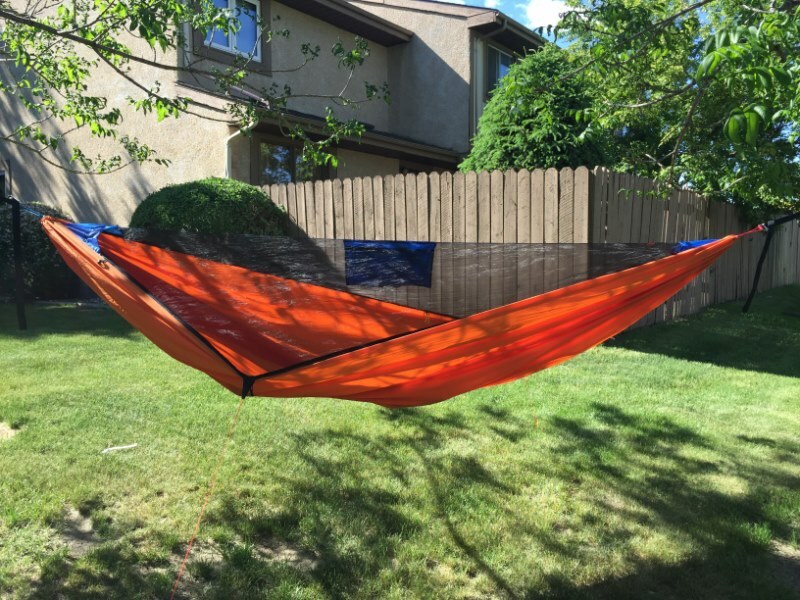 The bugnet on the Warrior Hammocks are designed to allow you to have openings on both sides of the hammock. Using 4 sliders you can position them anywhere. 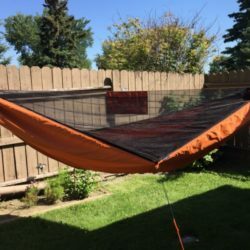 This is extremely important because it allows you to reach out either side to adjust your underquilt, grab something off the ground or just get out on either side. You can also open half the net, flip it over or unzip the bugnet so it’s hidden up in the foot peak area. It doesn’t come completely off but instead is super easy to zip and unzip. You aren’t fighting with zipper sliders reattaching stuff. In a word excellent , this is what comes to mind when I think of customer service and quality of the products. 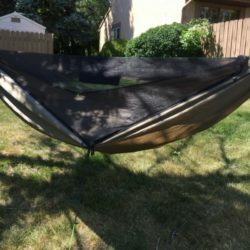 I ordered a warrior model and a tarp, James was very busy but went above and beyond to get me the goods for my Hammock meet-up. The setup was super easy and fast , the quality excellent. It was a baptism of fire on the first hang as we were hit by thunderstorms in NC , I stayed dry , warm and cozy. I slept like a baby and it was so comfortable my friends had to wake me in the morning. The snake skins came into their own when packing a wet tarp as the design allows water to escape . A big thank you and I had a great weekend. Everything about my LSOH Warrior Edge is top-notch. I’ve used it many times since purchasing, and it has held up well to the use. 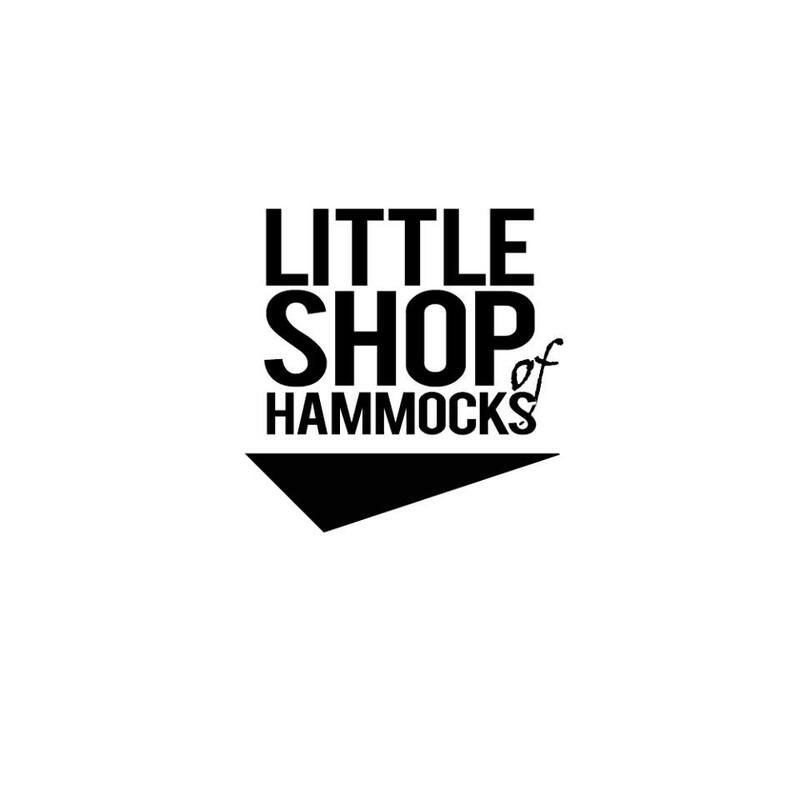 James has thought through all of the details, and designed an amazing hammock. We discussed fabrics and colours, and I couldn’t be happier with my Warrior Edge. One of my favourite features is the little loop built into the head-end of the continuous ridge line, used for anchoring my pillow! 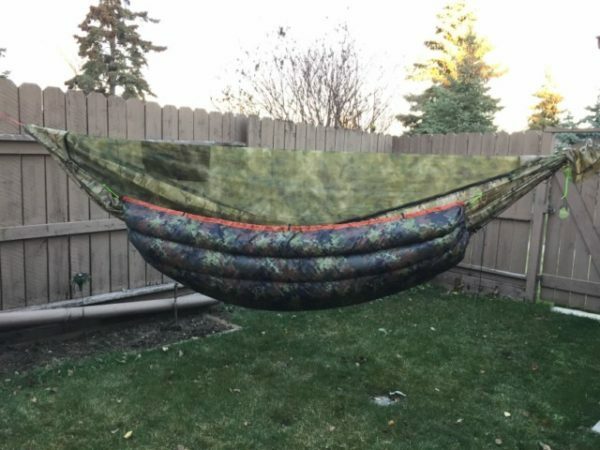 I also bought a TQ, UQ, and tarp, for a complete set. Couldn’t be happier with the products from LSOH!